The Ljubljana airport – Jože Pučnik, is situated 26 km north of Ljubljana city centre and approximately 200 km from Rovinj. The airport is connected to Ljubljana with an airport bus, which departures every hour on weekdays, and every second or third hour during weekends. If you are travelling to Rovinj from the airport in Ljubljana, you have the following options in terms of transportation. By car, majority of the road between the airport in Ljubljana and Rovinj is highway, which makes travelling quite fast and easy, the shortest route goes Via Koper and the border crossing in Dragonja, and alternative route via the border crossing in Jelšana has almost the same length but less highway and therefore longer travel time. If you travel with your own or a rented car, remember to buy a Vignette in Slovenia. Car rental offers for rental companies with office at the airport you can find here. Transfer, a transfer from the airport to Rovinj is a bit pricy, but never the less of course possible, normally transfer is offered for 1-3 person with a regular sedan vehicle and from 4 to 8 persons with a minivan, you can check prices and pre-book a transfer here. By Bus, there is NO direct bus from the Ljubljana airport to Rovinj, but, although the number of departures is limited, it is possible to travel directly from Ljubljana to Rovinj, you can see departures times here. Alternatively you can check out the connections via Trieste in Italy. By Taxi, well if you are left without any other options, you of course have the options to take a taxi from the airport in Ljubljana to Rovinj, but be aware it will cost you a few bugs. 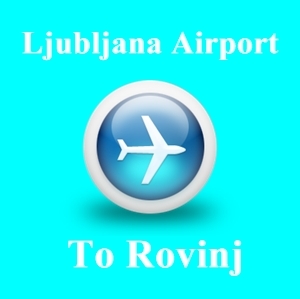 Feel free to leave a comment below if you have any questions about travelling from the Ljubljana airport to Rovinj.